Online Sheet Music Blog: Surprises at the Grammys! The 59th Annual Grammy Awards have come and gone. 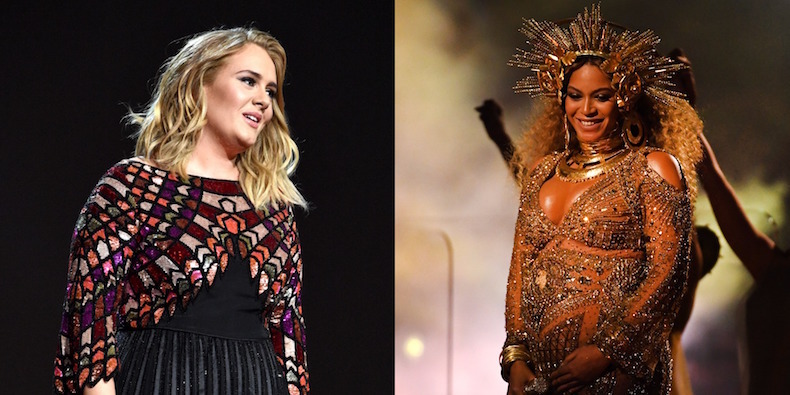 Critics endlessly hyped the contest of the evening – Adele versus Beyoncé in each of the four categories both artists were nominated for. The results are in, and it was a lopsided victory for Adele, who swept all five awards she was nominated for. “25” won Album of the Year, with flagship “Hello” winning Song of the Year. Although “Lemonade” took Best Urban Contemporary Album, Beyoncé has for the fourth time failed to win the Album of the Year category. 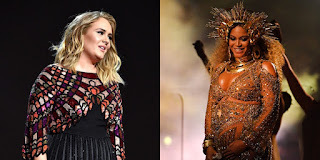 Nevertheless, Adele repeatedly paid tribute to Beyoncé, praising her artistry and influence. Adele also won Record of the Year (“Hello), Best Pop Solo Performance (“Hello”), and Best Pop Vocal Album (“25”). What surprised you about the 2017 Grammys? Feel strongly that someone else should have won, or that another song or album deserved an award? Let us know!